HISTORY – Shibuya Rex Co.,L td. Since the day we started a small store in 1951, many people have supported us with their warm hearts and smiles. Only 5㎡ store in front of Fukushima station. That was the beginning of Shibuya Rex. Yasuhiro Shibuya, the founder of Shibuya Rex, and his wife, Hisa have made progress little by little with the employees who lived in those days. 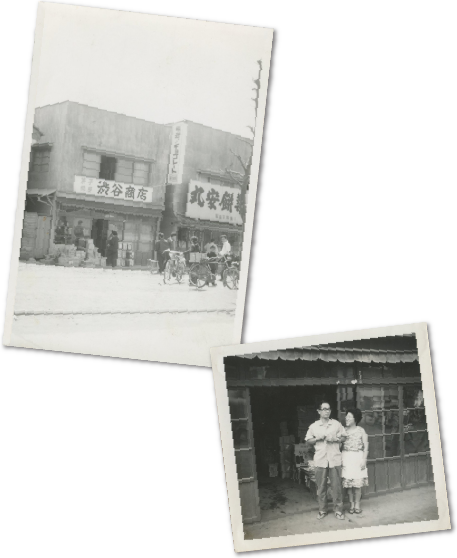 Today, in addition to wholesaler, we run a variety of businesses including retail store management, product development, and management of “Natsukashiya” that conducting sales and branding of traditional confections throughout Japan. Even now after our company was handed over to the second, third generation, we continue to grow unremittingly. We will continue to make efforts to provide dreams and smiles from Fukushima to everyone, through confectionery, being supported by suppliers, manufacturers, employees, and family. Our driving force is ardor and bonds with people. We aim for a company that will continue as long as 100 years.